Hello ladies and gentleman!! This is my first Giveaway ever here at brooklyncraft.com. 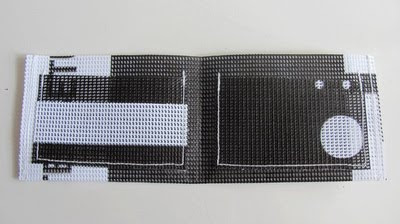 Today's giveaway is a handmade wallet, made form recycled billboard mesh vinyl! They are super sturdy and mine has yet to do anything except get more comfortable! It has 3 inside pockets and a money pocket. If you have any more questions about it, please feel free to ask. Please write a comment telling me about one thing you have recycled or "upcycled" lately and what you have repurposed it for. 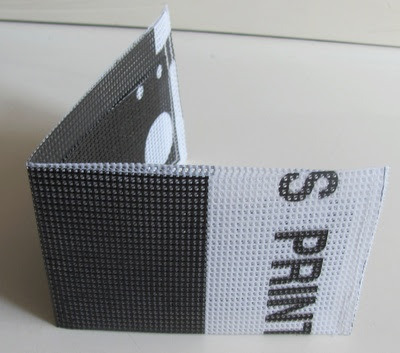 The winner will be chosen at random and will recieve this beautiful new wallet! I'm super into the idea of using those really pretty tea tins from cheap places like Pearl River and poking holes in the bottom and planting cute plants in 'em. I gave one as a house-warming present and it was a huge hit. Oooh so exciting! 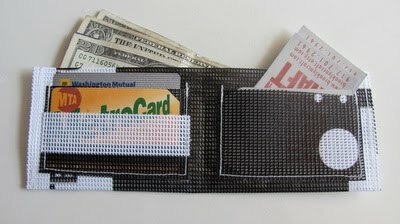 That wallet is awesome! Hope I win! A couple weekends ago, we were given better memory foam for our bed, so I took the old one, cut it up into the pieces of my couch cushions and re-padded my couch! It's not super beautiful (yet) but oh the functionality! WALLET! Vegan wallet even. You never mention it, but I'm pretty sure all of your stuff is vegan? You don't use wool stuff do you? furniture store threw out some old water damaged dressers. pick one up, sand her down, varnished with some pastewax(regular varnish and stain have harmful chemical) and made an enclosure for my cousin 10 Finches, they now have mad room to fly around in. Found an old 8' wooden ladder on the street, took it in, cleaned it up, put some strips of picture frames from the trash behind a framing place onto the shelves, and now it stands against the wall in my kitchen with the steps acting as shelves for a load of small potted plants. Plus, the cats dont seem to feel like climbing it to chew on stuff. Awesome work, by the way. Totally dig the site! Wow! I'm impressed! These are all great projects! On the front page of Etsy! Passport cover for a friends daughter.